Safety Center is set up and managed in an online portal, accessed through an internet browser. However, the Safety Center app is where the actual plans are housed, to be accessed by end-users. The Safety Center app can be downloaded to any smartphone that has the Apple App Store or the Google Play Store. Or, if you have a QR code reader on your smartphone, scan the codes below to locate the app in the store and then install it. When you first open the app, you are given the option to Login with an existing account, Create Account, or Continue without logging in. Whether or not you need to create an account depends on the security requirements of the plan you need to access. Plans in Safety Center can be assigned various levels of security, which impacts how the plan is accessed. These security levels range from having the plan listed publicly in the app, available for anyone to download, to requiring a user create an account and setup a PIN in order to access the plan. Contact your plan's Administrator for more information about how your plan should be accessed. Camera – The camera can be used to attach a photograph when submitting a report. The camera also serves as a flashlight that is accessed on the Settings screen. If an Administrator updates a plan that you have downloaded, you will be notified by a badge on the Safety Center app icon. 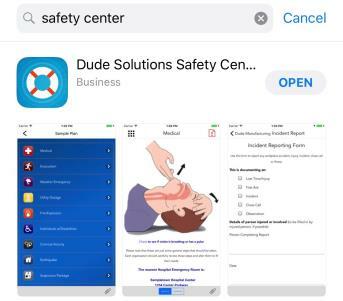 Tap the Safety Center app icon to open the app. 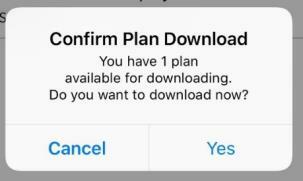 A pop up will appear, asking if you want to download the new version of the plan. Tap Yes and the plan will downloaded with the updated content.